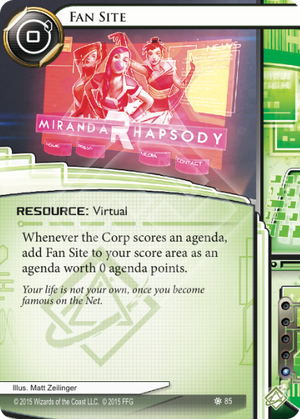 Whenever the Corp scores an agenda, add Fan Site to your score area as an agenda worth 0 agenda points. Your life is not your own, once you become famous on the Net. Most commonly combined with Artist Colony to fetch any installable at ability speed (the only limitation is what you can fit in your deck,) Fan Site can also be used with Liberated Chela and an extra click to potentially become actual points, Frame Job for a Bad Publicity, or Data Dealer for straight cash. Those cards also let you dump negative point traps like News Team and Shi.Kyū for a profit, should your opponent offer that opportunity. Great targets for Artist Colony include Icebreakers, New Angeles City Hall, Plascrete Carapace, Film Critic, R&D Interface, Clot, Security Nexus, Hades Shard, etc. Do note that this can become a liability with Philotic Entanglement, however. Fan Site is fuel for Frame Job (Which is a wonderful bit of flavor - e-tabloid conspiracy theory website, perhaps?) or for Data Dealer. Because it is worth no points and because there is currently no way to increase the value of agendas in your score area, it only behooves you to sacrifice the Site to one of these engines. If you don't sell off your Fan Sites, some bad things can start happening. Philotic Entanglement deals extra damage and The Board can put your score in the negatives. Also, because this agenda can't be scored, it's not Turntable fodder either. So, let's talk about these uses. Data Dealer: A 9/ swing is pretty astounding, but consider what has to go into it. You'll have to install the Fan Site, install the Data Dealer, and then use the Dealer. a 3 per-click efficiency is pretty great, but it also requires that you allow the Corp to score an agenda. For this reason, Iain Stirling: Retired Spook` is probably your ideal candidate - scramble to install all three Sites, let the Corp score an agenda and then drop the hammer on them with your piles of money. Frame Job: For three influence, any Anarch now has access to 3 Bad Publicity. Compared to Investigative Journalism, Frame Job + Fan Site saves you two clicks, removing the difficulty with expending an entire turn to toss on another Bad Publicity and the requirement of having a Bad Pub to begin with. Itinerant Protesters and Fisk Investment Seminar allow you to seriously control the Corp's hand by forcing them to overdraw and limiting what they keep. Couple that with tried-and-true Anarch milling techniques (Noise: Hacker Extraordinaire, Keyhole, Data Leak Reversal) and you've got a seriously frustrating control deck.